Jasper stones are members of the Chalcedony family of gemstones. Chalcedony (kal SED' nee) is any form of microcrystalline quartz, where the crystals are too small to be seen without high magnification. However, in the rock world, only the translucent or transparent, single color types are sold as "chalcedony stones". Most of the other semi precious stones fall under the Agate or Jasper category. Jasper is considered a semi precious stone. It usually refers to an opaque stone, with a solid color or an irregular display of colors caused by various mineral impurities. 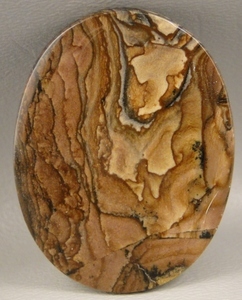 The name Jasper is derived from the Greek word that means “spotted stone”. Jaspers are found all over the world, with certain colors or patterns unique to particular localities. 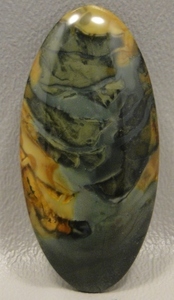 All Jasper cabochons take an excellent polish, are trouble free to care for, and hardy enough for all jewelry stones. 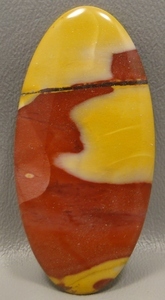 Most Jasper stones are named after their colors or their appearance (for instance Poppy Jasper or Dalmatian Jasper), or from where they are found (Mookaite Jasper or Owyhee Jasper). Jasper was a favorite in the ancient world, and can be traced back in Hebrew, Assyrian, Persian, Greek & Latin. People of the 4th century called it a "rain-bringer". It was used to drive away evil spirits and protect against snake and spider bites. Metaphysical Properties: Jasper is said to have a stabilizing effect, and help one take all one's energy and use it in a balanced manner. It is also said to be a stone that helps in all areas of survival, and is a very protective stone. At BarlowsGems we specilize in rare and unique Jasper cabochons. We travel the world looking for striking patterns and bright colors. 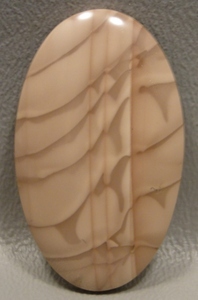 We personally orientate each Jasper cabochon to get the best possible pattern. Each Jasper cabochon is hand cut and polished. Please check out all the cabochons we have by exploring our store. You can click on a material type to the left or you can search for specific shapes or colors.